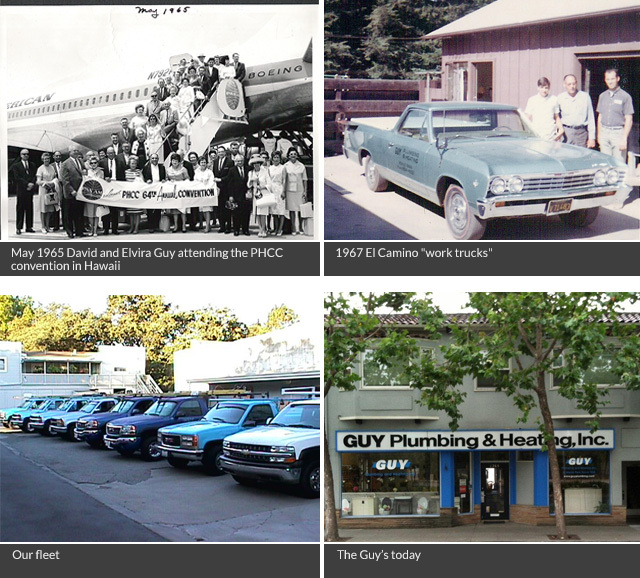 In 1948 in the small town of Menlo Park, David Donald Guy first established his plumbing service business working out of family home on Oakley Ave. With his wife Elvira by his side, he built a foundation for the family business to follow It was a few years later that he was joined by his son’s Roger, Alan and Mike and Guy Plumbing was born. Incorporated in 1973, Roger and Alan continued running the plumbing service business and were joined by Roger’s son David. In 1988 they moved to its present location at 1265 El Camino Real and opened up a plumbing showroom. Alan and David’s grandson David along with their wives run the service and showroom. In 2009, David’s Great granddaughter Camille joined the family business bringing in the fourth generation of Guys.